There?s a new initiative for STEM students looking for that coveted future tech job at a sought-after, innovative company. Unlike other initiatives that may consist of only monetary scholarships, this one is a ?full comprehensive program? that ensures that college students will be prepared to work at the nation?s top tech companies, in this case, Apple. 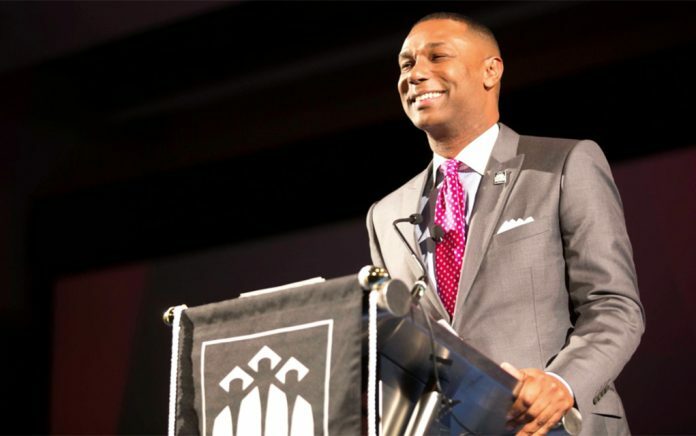 Thurgood Marshall College Fund (TMCF) CEO Johnny C. Taylor, Jr., a former HR executive in the tech space, has forged what has now become a first-of-its-kind 10-year program committed to HBCU students that he says is also ?a solution to Apple?s diversity challenges.? Here, Taylor speaks to TNJ.com in depth about the particulars. TNJ.com: How did the Thurgood Marshall College Fund come to partner with Apple to create an initiative to help STEM students from HBCUs get prepared for a future in the tech space?? Was it, at all, a result of Reverend Jesse Jackson?s big push for diversity at tech companies over the past couple of years? Johnny C. Taylor: I came from industry. Before joining the Thurgood Marshall College Fund, I was the head of HR and the CEO of a division at a tech company called IAC Interactive Corp. That was my background and it informed my strategy at Thurgood Marshall College Fund, which was to reach out to my former colleagues in the tech space. I realized first-hand the lack of diversity in the tech space because I was responsible for staffing tech companies.? I figured that was an opportunity for us as a group of institutions to make a case for an investment in HBCUs as opposed to charity into HBCUs. So, I reached out to Apple. I did not know at the time that Reverend Jackson was having conversations in that space. We were running parallel paths calling out the diversity issues. That being said, it was fortuitous, it was fate, it was God, whatever you want to call it that Apple was having a Reverend Jackson being a critical voice followed by the Thurgood Marshall College Fund, through me, saying: now, here?s a solution. Too often we come to organizations and we complain about the problem, but we don?t offer solutions. TNJ.com: What was your solution? J.C.T. : We offered to Apple a solution that was very simple. We said, ?If you continue fishing out of the same pond that is not delivering you results, then you should blame yourselves for not being creative and innovative.? Apple says they are a tech company that is creative and innovative, yet they go to the same 5 or 10 institutions looking for talent: Harvard, Stanford, etc.? I came up with the idea that if they really want to solve their diversity problem, they would need to expand the pond from which they fish. Apple bought it. We came up with a solution by proposing what has become the gold standard in recruiting HBCUs and helping to solve Apple?s diversity challenges. And hopefully, it will serve as a role model for the entire industry. #1: Expand the schools from which they search. HBCUs can fill that. As I mentioned earlier, instead of pulling talent from the same schools, consider HBCUs. #2: Build a relationship with HBCU students. Begin very early introducing students to the tech space. Many of our students come from the Deep South or the East coast so they don?t even know that these companies and opportunities on the West Coast exist.? We have to do a very good job at being present on these campuses – and more than just once a year at recruitment fairs with 100 other employers but literally establishing relationships with them. #3 Provide some scholarships. Bring some dollars to the table so that Apple is actually invested in the institutions. This year, 33 select students were each given $25,000 scholarships. Also, put something in it for the faculty responsible for teaching the students. So in addition, they gave away 1$ million worth of faculty grants to our schools. Apple also provided an all-expenses-paid Faculty Summit in Cupertino. Our best faculty members went there and spoke to Apple?s people to find out exactly what is needed from students in order to ensure a future in the tech space. The summit informed some necessary curriculum changes.? If a student graduates with a 4.0 GPA, but studied the wrong computer language she or he will not be hired by Apple. Period. The student has to be prepared, ultimately, to be successful in their environment. #4 Preparation for the summer internship program. Because so many of our students are first generation, we need to do more than just have them show up for their summer internships. So, we brought them in advance in March to a week-long immersion program in Silicon Valley to prepare them. And when they arrived for their summer internship program, it wasn?t for the first time. They were familiar with the neighborhood and the company. We wanted to make sure they did not spend their first 2 weeks of a 12-week program getting familiar with things and then fail. A combination of faculty investment, student investment, institution investment, and being present on campuses has created a unique program that was specifically designed to solve a problem by removing barriers. TNJ.com: Is there a chance that some of them might get jobs at Apple? J.C.T. : The summer is not yet over so we don?t have final numbers. Two of them are sophomores, so they will likely compete to do another internship next summer. The rest are juniors. The key here is that these are not offers to work in the Apple store. The jobs are in their headquarters?on their engineering and product development teams. These jobs are hard to get and you don?t typically see African Americans, particularly from HBCUs, in that population. It has never happened. And that is what is so innovative about it. Apple can make the case that the number of African American employees is higher than it is because they are counting people who work in the Apple store or at help desks, but we are looking for the critical jobs in the corporate headquarters office. TNJ.com: Is this expected to be a permanent program? J.C.T. : Yes, it is a fully funded, 10-year program. And kudos to Apple. It was their initial funding and that was a critical component. Too often people want to go small and test it out. Our proposal to Apple was that they send the message that they know it is going to work and that they are in it for the long haul. We know it will not be perfect. In the first year, sure there might be a hiccup or two because we designed something that has never been done before ? combining all of these characteristics into one comprehensive program is true innovation. I give them huge “hats off” for having the will to make it work. Believe it or not, in the beginning we only planned on having 20 interns. They hired 33. TNJ.com: Tell me about the selection process. J.C.T. : It is a highly competitive process! We opened in the fall with an uber competitive process: students went through personal interviews, they were interviewed via video, their GPA was taken into account, and they wrote essays. In addition, they went through a fairly comprehensive, Gallup, TMCF-designed tool to determine the students’ ability to be successful at a company like Apple.? They go through a battery of tests to make it through the cut. There were 1,400 applications for only 20 spots. TNJ.com: How was the Faculty Summit that Apple hosted in Silicon Valley? J.C.T. : It was amazing. Apple and TMCF hosted 24 HBCU deans and faculty members from 15?HBCU accredited engineering schools at the Cupertino Headquarters to help them build their capacity to prepare even more students to consider tech careers. I flew out to see them. We also flew out Dr. Gwendolyn Boyd, president of Alabama State University, who herself is an HBCU graduate and a masters degree graduate in engineering from Yale University. It was great to hear directly from industry, to hear about industry needs. It was the highest level of feedback from any of our faculty programs. Apple representatives basically told our faculty how to prepare students, in a relevant way, for a career in tech. And the representatives were senior members of the company: people who actually design and develop their hardware. Everyone was there!